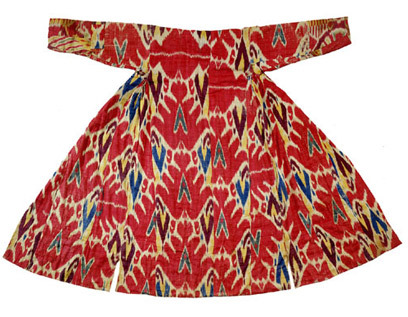 The term 'ikat' comes from the Malay word 'mengikat', meaning to tie or to bind. This refers to the tie-dyeing method used to give these textiles their unque vibrancy of colour and design. 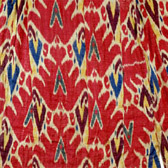 Ikat has now come to refer to the textiles themselves as well as the process. 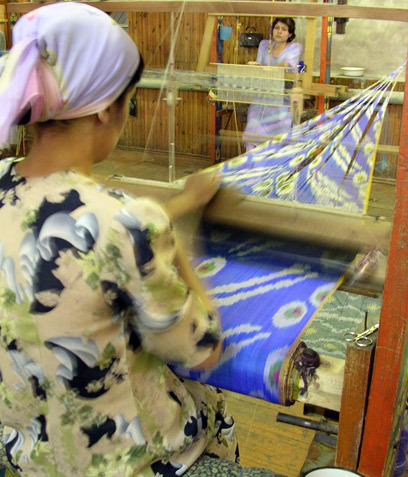 The following series of images show how Central Asian ikats are made, and are specific to current ikat production at Marghilan in Uzbekistan. 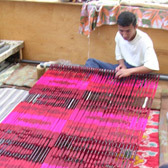 The workshop there continues to use traditional inherited methods and so provides a good understanding of how ikats are produced using the warp ikat technique. 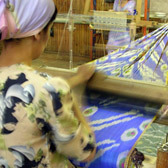 The first stage of making an ikat textile is making the silk thread. This is done by putting the cocoons into a pot of boiling water in order to kill the caterpillar and to dissolve the sericin, a kind of glue which binds the threads together. 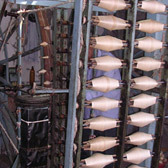 The released silk filaments are then extracted using a stick or brush to catch the ends and are then wound by hand into skeins, directly from the pot. Once the silk threads are unwound from the cocoon, they are of very uneven quality and need to be evened out and strenghthened by winding them onto a hand-turned frame or spool. They are also repeatedly boiled to increase the whiteness and strength. 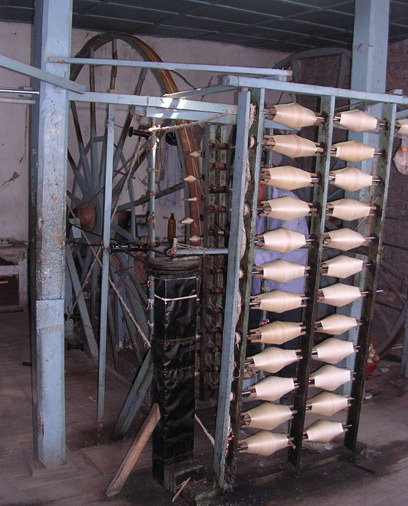 Evened out and strenghtened, the silk threads are then reeled onto bobbins ready to spin the warp threads (the warp threads are the lengthwise threads as the textile is woven; the wefts are the horizontal threads). 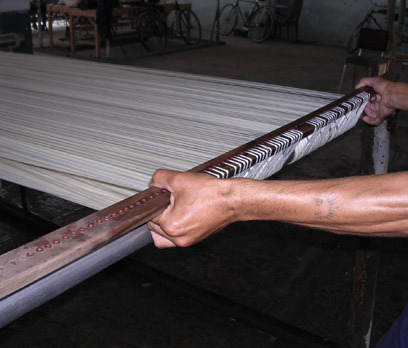 The next stage of preparing the warp is to bind the areas of the threads that are to resist the dye of the first dye bath. 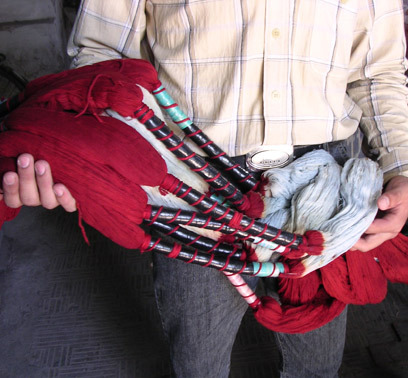 These areas are wrapped tightly with cotton threads and wax is added to ensure that the tied areas remain undyed. The whole of the warp is then removed from its frame and sent to the dye house for its first application of colour. 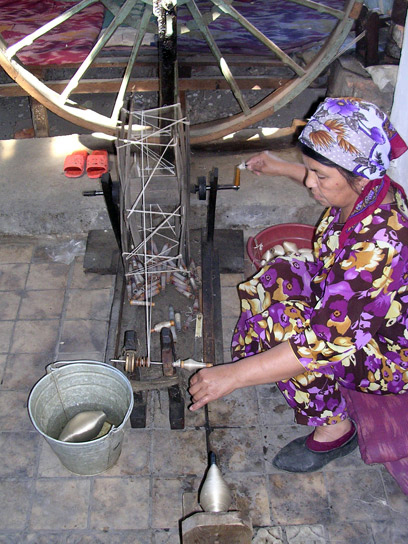 A vertical frame holding several bobbins feeds the threads onto a very large spinning wheel (with a circumference of 6.75 metres) to start the process of stretching them out to their full length. This can be up to 200 metres long. 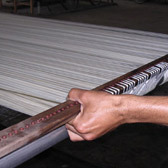 Once the weft threads have been fully prepared - stretched, strengthened and divided into warp lengths - the silk threads are then sent to the ikat binding workshop ('abr-bandi') where they are separated into even groups, called 'livits', and threaded through between 40 and 60 holes pierced into the ends of a large wooden patterning frame. Once the warp is laid out in this way the designer marks out the patterns directly onto the threads using charcoal. He draws the outline and indicates the areas intended for each colour. When all the dyes are applied to the ikat warp, the threads are once again returned to the binding workshop and unbound for the final time and sent to the weaving workshop. There the warp is cut into shorter lengths ready for weaving. 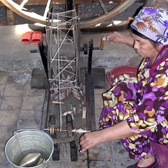 The warp is attached to a simple treadle loom (a loom in which pedals move the warps so that the wefts can be passed through). 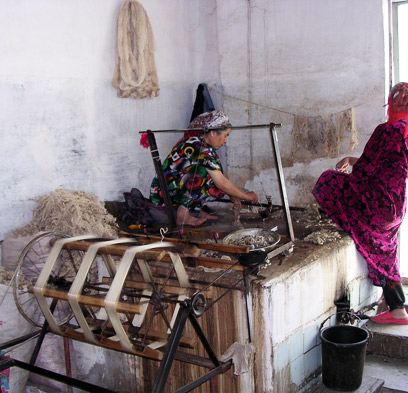 Central Asian ikats are warp-faced textiles, which means that the warp thread is much denser than the weft thread. The pattern of the warp is therefore not interrupted by the weft so the work of the designers, binders and dyers is visible to full effect. The final stage is to apply a finish to the the textile to give it its distinctly shiny surface. Various methods such as an egg-white solution or a type of glue are used - this is applied to the cloth and beaten with a convex wooden hammer or a glass sphere, which also helps to shine, soften the surface and give the cloth a slightly rippled effect. Alternitavely, no finishing solution was applied but the cloth is beaten in the same way. This releases the natural oils of the silk thread and provides a shine to the surface. The warp, removed from the warp frame, is bundled up ready for dyeing. At the dye house the threads are wrapped loosely around a long pole and immersed into a dye bath. This dyeing and binding process is extremely complex. For a multi-coloured ikat, reds and yellows tended to be applied first with a hot dye bath. These colours are applied in separate workshops to those in which the indigo dye is applied with a cold dye bath. 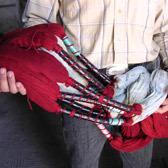 After each dye is applied, the threads are wrung out by hand and returned to the ikat binding workshop, where the tied areas of the warp are unbound. They are then fixed to the patterning frame once again and the next area marked out for a particular colour was tied. 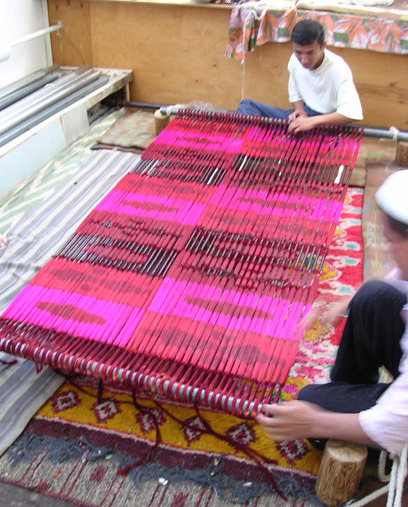 In the more complex ikats, this process is repeated several times, passing repeatedly between the designer and binders and the various dyeing workshops. The motifs and patterns that decorate ikats respond to both the long-standing traditions of Central Asian art and the particular urban tastes of the 19th-century market. The prominence of overall repeating patterns reflects the Islamic tradition, while motifs such as ram's horns and cypress trees reach back to a more ancient past. Floral decoration, dominant in Islamic art and inspired by the flora of the steppe lands, often features. 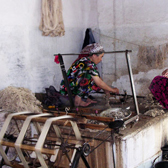 The influence of the local arts of carpet making and embroidery is also strikingly present, for example in the use of large repeating circles. Designers combined, abstracted and moulded these inherited motifs to work with the technical and aesthetic demands of ikat. Some of the motifs, such as the jewellery and pendant patterns, once had amuletic, protective qualities. But they lose these special meanings when incorporated into the contemporary design vocabulary of ikat. The magnificent range of colours is central to the appeal of Central Asian ikats. In places that produced ikats there were many dye houses where colours were painstakingly prepared and applied. 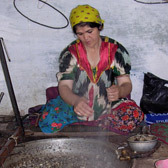 Despite the skill involved, working with dyes was a low-status job associated with smell and mess. Dyes were extracted from a variety of natural resources. Red dyes came from the cochineal insect or madder root; green from the seedpods and flowers of the pagoda tree. Yellow was made from delphinium flowers or saffron, and pinks from brazilwood. Black dyes came from the black mallow plant or pistachio trees. Indigo came from the indigo plant, but was imported as blocks of prepared dye from India. The dye trade and many of the dye houses were run by Jews. 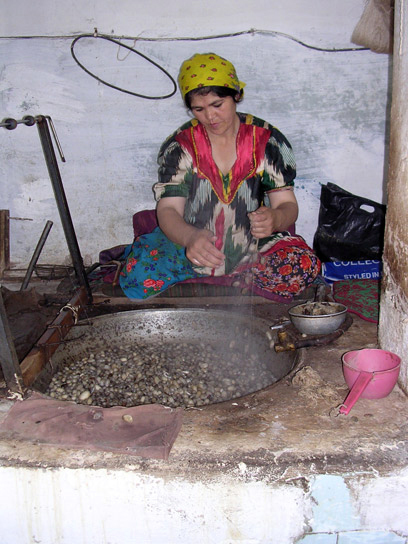 They operated the indigo cold dye houses while the Tajiks (Persian speakers of Iranian origin) tended the hot dye baths, applying yellows and reds.